These are two different Charms and either one of them can be used. I take no responsibility if anything goes wrong and you get a slap instead of a kiss; it all depends upon your intentions. This Charm has to be written on a blank piece of paper; any ink will do. Then the name of the person you love has to be written down after the lines below the numbers; both the lines, so write the name twice. Then roll this piece of paper and throw it into a fire. This love spell I am told ensures that this person will start loving you; even if he or she has a heart of stone. This Charm is a mantra which has to be inscribed on a thick piece of copper. Then the Charm has to be kept in you pocket or any other place on the body. This love spell make the person you love become positive towards you after about 6 to 7 days. 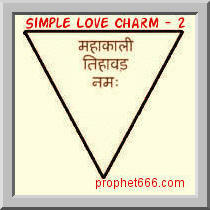 sir Charm-2 me copper ka size kitna hona chahie or kya iski shape triangle me banani hai.? The shape is given above, the size can be made to fit the letters in the charm. I have given rest of the information in the post itself. i have question regarding first love charm. is it required to draw lines below numbers or they are shown by you for differentiating purpose only. 1.should we use this charm only once for the person we want to attract or we have to keep on doing it until we get any positive vibes? 2.After burning the paper where should we throw the ash? ?i dont have any pond or river near by my location. You should try only once on the same person and wait for a few days to see if you get results. If there is no pond or river you can throw it in a well or canal. I do not have any kind of water body near by my house even a well or a pond .where should i throw the ashes?please reply soon. It is described in the post as well as the reply to the comment. If these water bodies cannot be found by you then do not practice this Yantra. One of my friends told me that the ashes can be put in a mug of water and then the water can be used to water the plants,Is this true? first charm has really worked for me..within a month he came back to me..but still he has not confessed...shall i try it once again .. I have done the 1st charm 10days before,no result.can i do it again on same person?he stays out of India.will it work for him? I have one confusion for the 1st charm. Do we have to throw in fire or we can burn it? I shoould burn it or throw it in already buring fire in something ? Light a small fire and throw the charm into it. What kind of ink should i use to write on the coper plate? The first charm did worked for me in 2 days as it changed the negative attitude of person towards me.for which i tried this charm. Do i need to write the name of the desired person with surname or just name ? @Payal - Yes you are right, you have to write those numbers as shown in the above post and after that the lines also u have to do..Than below that write the name as shown and you have to lite small fire than thrown that paper into that and do visarjan of ashes in river. That's it. Do it with full faith. Did yu try it? Did it work ? And does it have any side effects ? Thank you Amit for your help. What do you mean by lighting a fire?what shall I use to light a fire? I used this charm earlier but it did not work.I burnt few " karpoors" on a plate and threw the rolled paper in it. I guess I am doing something wrong. Since you have got a positive result I would really appreciate if you specify this lighting a fire portion. The rest of the method is clear. @ Siddhi Sarma - Small Fire means i would tell light a fire of some wood sticks and throw the paper into it. And wait and see. Do not expect results in a moments and days.Sometimes it might take some more days too. Faith is required and Trust on God too. Hey Amit if the person on whom I casted the tantra has a lover, will it work or will it have areverse effect on me? Can the hindi numberings be written in english or it has to be written in hindi only? Though this charm can take time depending on situation, i write the mantra as given above and names 2 times as described above. i burnt the paper from holy fire and put in small utensil and then did visarjan in flowing water. though my purpose was just to make a person favourable so it was fast. Writing in Hindi is always preferable; if unable to do so then you can try English. @ Dear Anish, Can u tell the meaning of holy fire do u mean the fire which is burnt in holy festival or something else? Holy fire means fire from source of worship, hawan etc. as mentioned burning fire in the above charm is also fire to be lit as we do in hawan. It will be really really helpful to everybody here if u say fire should be light exactly of what? Wood fire or hawan fire should be done? Can we burn this charm with Agarbatti as it is also a holy form of fire. Please mention 1 example. It will be really helpful..
No a small fire has to be lit and the charm thrown into it; not necessarily a Havan, the fire can be lit with some twigs, in a metal vessel or plate. Twigs means a small wooden sticks am i right? And we can burn those twigs with match stick or something else right sir? I stay near sea-shore, can i do the visarjan of the ashes in the sea? Hi prophet, can you guide on the steps to do the first charm please. I want this, thank you. Kya yeh charm stepmother ya father kay upar use kiya ja sakta hai?? can i go to a sea which s little far away frm my hse ??? Yes you can immerse the charms in the sea. Hi...can love charm 1 apply to someone who is elsewhere in d world and to other races? I am a chinese and my woman is also a chinese. If I do not have a river or pond nearby, wil it be ok if I am to throw the ashes into a big watet fountain? Hello would the first charm work if I burn it with a candle and if the pond is frozen as where I live it's winter right now thanks. Can you also let us know, how to reverse the effect of these charms.? Also is it Ok, if the fire created from newspapers, and then the "charm" thrown into it.? There will be no side effects if you use them for rightful purposes. If misused then the side-effects will be there. Any kind of fire is ok.
what kind of mis-use are you referring to.? 2) Also, how to we reverse the effect of this Yantra.? sir i tried this today but instead on rolling the charm i just folded the charm twice and threw it on fire and then collected the ashes and threw it on pond?is that ok ? pls reply or do i need to do it again? The Charms have to be drawn as shown in the images. The usually spoken name of the person can be written on the Yantra. Sir pranam. I have done a mistake. I draw the first love charm in the black paper coz I didnt notice blank. After burning it then I realize and again drawn it in white paper and burned and throw the ashes . Will there be any problem??? im a little confused about the person's name's hindi spellings, can i write the name in english, but the numbers just like they are as shown in the picture above? Yes, you can write the name in English or your Mother Tongue, it does not matter. The recommended method is to put the ashes in a flowing water body, like the sea or a river, if that is not possible, then a pond, lake or well will do. Putting in a mug or feeding plants is unadvisable. I put the ashes in a drain. Will it work? And if the person on whom tantra is being cast has a lover, will it work? A small fire has to be lit, then the ashes have to be collected and thrown in a water body, is what the Tantra prescribes. Does not matter if the wind blows some of the ash here and there. Neel sir till how many days I have to wait for the effects of the charm.... ? Coz m really counting on this charm.... please lemme know sir. The usually spoken name of the person can be written, If you call the person Rekha, you can write Rekha or if you call her Rekha Verma, you can write Rekha Verma. Camphor can be use for creating the fire. If you are truly in love with that person, then there will be no side effects, even if you make a slight mistake in the Tantra. You can follow any of these remedies, including this one to resolve your problems. Read the replies to the comments above, all the needed information about these love charms can be found there. Respected sir, Is this charm is only for lover or can we use this charm to influence a powerful person to get his friendship or to become his beloved staff. Please guide me, Thanking you Sir. Ok, you can try using the charm for the purpose you have in mind. Namaste guruji, can I write it down with ink on a piece of copper by the second mantra? It should be engraved on copper and not drawn. joy because I have a very beautiful lady who by herself walk up to me and asked me up for dating, she does not only love me , but loyal also to me. I have been with her for almost a year , no problem. he is the best so far. Sir,good evening. Please am in love with an Italian man and am a Nigerian .I want to know if he truly loves me and I want him to come for me please help me out.thanks. I tried the first yantra. After the yantra turned into ashes. I threw the ashes in a dustbin. Does that mean it that the charm will be ineffective?